Greg Searle has had his place confirmed in Great Britain’s rowing team for this summer’s Olympics, when he will be aiming to win a second gold medal – 20 years after his first – at the age of 40. Searle, who has spent his career at Molesey Boat Club, was Olympic champion with brother Jonny in Barcelona in 1992 and competed at the 1996 and 2000 Olympics before retiring. The former Hampton School pupil made a comeback in October 2009 and has since won successive world silver medals in the Great Britain eight – the boat in which he will now compete in London. Searle was told in January by coach Jurgen Grobler that he would be competing at the Olympics, fulfilling a comeback he first conceived when London was awarded the Games seven years ago. “It’s a fantastic day to be officially selected. To be honest it was more special when I went into a small room and Jurgen told me I’d done enough,” Searle told West London Sport. “I’ve got to be honest: I welled up a bit and realised the thing I’ve dreamt of since 2005, when that envelope was opened and the word ‘London’ was said, was going to happen. “Today is a rubber stamp of what we knew. We’re already totally focused on 1 August and making the eight go as fast as we can. Molesey BC is heavily represented, with six men in the squad. Their captain Andy Hodge and club-mate Tom James are both in the coxless four alongside Pete Reed and Alex Gregory – the sole change from the line-up that won gold in Beijing four years ago. 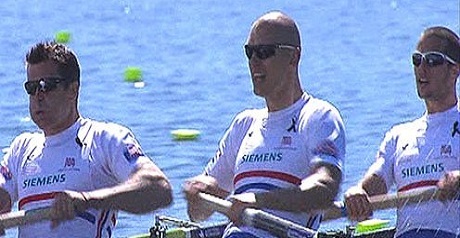 Alan Campbell, a member of Chiswick’s Tideway Scullers School, has been confirmed as GB’s entry in the single sculls. Great Britain team management had thought he might have a better chance of an Olympic gold in a double scull but Campbell wanted to stay in the single. Bill Lucas of the men’s double scull, Rob Williams from the lightweight four and Sophie Hosking from the lightweight women’s double scull, are all from Putney-based London RC. Many others in the squad live in west London and train at the team headquarters in Caversham, near Reading. The squad have one final World Cup event in Munich from 15-17 June before beginning their final preparations for the Olympic regatta at Dorney Lake, near Windsor, from 28 July.